Столько времени прошло, а новый Burn The Lighter так и не вышел! Исправляем ситуацию, причём в совершенно новом формате. Тема для скачки и обсуждения. A tribute to the ZX Spectrum and the golden age of British gaming from veteran games journalist Dan Whitehead. Witty write-ups on fifty classic games that helped define the ZX Spectrum. Buy it at Amazon.co.uk for just £3.99. Robee Shepherd has released a new utility MinnaMicroZ80 v0.21. This is a Windows command line utility for converting Z80 snapshots so they can be restored on a real Spectrum from a Microdrive cartridge. It also includes a BASIC loader utility that you should install to each cartridge, and that supports multiple games on a single cartridge. This game was written as a fan-based game, modelled after the original Knightmare on MSX, made by Konami in 1986. Since that time, numerous clones and conversions of this game have appeared for other systems, but none were made for the ZX Spectrum... Until now. Graphics and Mapping by Mcneil. SG-Team has released two more cracked games. This time, we've got Blinky's Scary School & Titanic Blinky by Zeppelin Games Ltd.
Also included is the fix for the Pentagon clones. 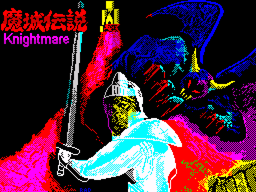 Over 550 walkthrough videos of ZX Spectrum games  all in one place. Subscribe now. Note: RZX has evolved with input from the SPIN Team, Spectaculator and RamSoft authors into a fantastic medium for recording your performance on a Spectrum game. Step by step guide from Nodeus shows how to convert Midi to TurboSound (2xAY) module for Vortex Tracker. Watch. Guesser has released another useful thing for Spectranet. This packages up a spectranet rom module with a small installer program so that it can be installed on a spectranet without having to send it over the network with "ethup". The requirement of using ethup means you can't install a module without using a PC. It also makes it hard if not impossible to install modules into an emulated spectranet using the current implementation in Fuse (you can't send data to fuse using ethup on windows at least). Tuna has just published a quick heads up about the WoSBridge for Spectranet. Well, it allows you to use the Spectranet to directly search and download from the WoS archives. You %mount the WoSBridge like any Spectranet drive. Rather than presenting endless directories for you to navigate through, the root directory starts off relatively empty. To search for a game, simply %cd "Your search term". The WoSBridge creates a new directory for that search. If there's only one result, the directory will contain the downloadable files for the matching title. If there are many results, the directory will contain a subdirectory for each title. Searches only last for the duration of your session. In the root directory there are two directories that show the most recent and most popular titles that have been downloaded by all users. 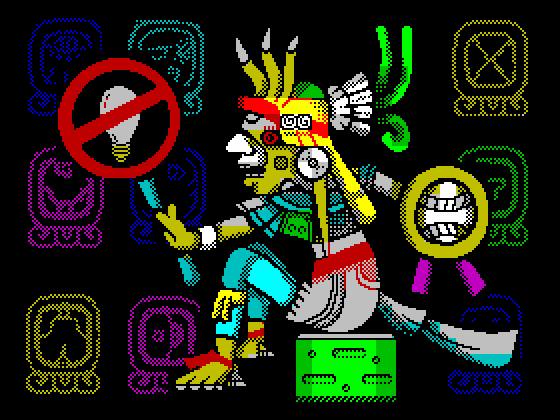 SG-Team proudly presents a new TR-DOS crack of "Thingy and the Doodahs" by Americana Software Ltd.
Shiru has released new version of beeper sound effects cross editor for ZX Spectrum 48K. Assembly output is more compatible with assemblers other than SjAsmPlus. 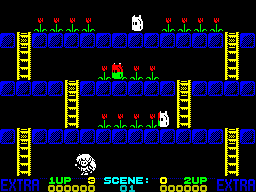 Famous game by Storm Software has been coloured by Ralf. Both Z80 and TRD versions are available. Nodeus has uploaded next demos to the channel in HD 1080p quality.  5th element by Eternity Industry.  Black Fury by Eternity Industry. Ugol' Party 2012 (also known as Coal Party 2012) was the third Ukrainian party in the annual series, which takes place in Donetsk, and it has ended those weekends! It wasn't really big, in fact, but not only the participants had tons of fun at the partyplace, there have also been a couple of prods made by those who couldn't come: one is a little intro by John North and another one is a ProTracker 3 module by me, nix./site. Click here to see all the photos and videos of Ugol' Party 2012.  Sprite cloning - creates clones of a sprite at your coordinates, inheriting the original's animation and other properties. Useful for static animated graphics. Enjoy, and grab from www.specbas.co.uk.